Sid Meier’s Colonization is being re-made! Is this a good thing or a bad thing? Game re-makes have been around for many years now, games developers and publishers every so often have a ‘brainwave’ and end up improving on classic older titles — perhaps others feel they can at least sell a few games off the back of original’s reputation regardless of what they produce? When it comes to Sid Meier though I think he’s definitely in the former category – not only can he produce a great game once, but he can reproduce it over a decade later! Do Video Game Re-Makes Work? Sometimes you get a game that lives up to the predecessor and perhaps even takes it to a new level of success by taking advantage of the new technologies on offer, one such well-known example was that of Prince of Persia. I remember playing this game the first time around on the 8-bit computers such as the Commodore 64, the graphics and gameplay were pretty simple like many games back then, but it was a game that was at least well executed for what it was — that said, I was never a huge fan of the game, to be honest, and I certainly never got close to finishing it. With the updated instalments, the Prince of Persia series has really pushed back the boundaries of gameplay and graphics compared with the original thanks to the power of the modern gaming platforms. I enjoyed that game a lot more, but it probably wasn’t my kind of game ultimately as I didn’t finish that game either. One arcade-style game that I did really enjoy when it was first released was Golden Axe, there’s now a re-make coming for that too. However, I’m not sure whether that game will capture the charm of the original and as such, I currently don’t have much excitement over that release. However, there’s an upcoming re-make that I’ll definitely be playing — it’s time for Colonization! Sid Meier’s Colonization – A Re-Make Worth My Time? In my previous Blog Banter articles, I’ve written about one of my favourite games franchises, Sid Meier’s brilliant Civilization franchise which has always appealed to the strategic and analytical gamer in me. The fact that it was turn-based meant that it gave me more time to ponder what direction I would take at each step, even more, the scope for carefully planned and decisive strategies that aren’t normally open to you in real-time strategy (RTS) games. 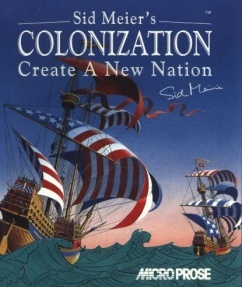 Sid Meier followed the original wide-ranging Civilization game that dealt with around 6000 years of your civilization’s history, with one that would then focus in on a more specific time in history — the colonization and ultimately the struggle for independence of the new world of America. Looking back on it, Sid Meier’s Colonization seems to have been Civilization’s poor relation, but I have fond memories of setting up towns, harvesting, trading goods, dealing with the native population and creating a military to eventually win our war of independence! Perhaps it’s the entrepreneur in me that appreciated the strong focus on the aspect of trading in this game – selling goods back to the homeland for a tidy profit, which can then be invested in your own militia force to that will ultimately allow you to sever your ties and win your freedom! Sid Meier creates great games, but one of the best things about him, in my opinion, is that he is willing to go back and re-visit what he’s done before and see how he can re-create and improve it for the modern platforms available as has been the case with Civilization, Railroad Tycoon and Pirates! And now he’s turned his attention to Colonization which will be released this month, I’m really looking forward to this as the original is that old now, that even if I wanted to go back and play it, I probably couldn’t get it to work on a modern Windows PC. I’m sure I won’t be alone in wanting to revisit this game, not to mention the potential for a new audience now — perhaps it will receive more recognition this time around? What do you think to re-makes of older games? Are in favour of them? What games would you like to see re-made for your modern computer and consoles? Welcome to the latest instalment of Blog Banter, the monthly blogging extravaganza created by bs angel and coordinated by Game Couch. Blog Banter involves our cosy community of enthusiastic gaming bloggers, a common topic, and a week to post articles pertaining to the said topic. The results are quite entertaining and can range from deep insight to ROFLMAO. Any questions about Blog Banter should be directed here. Check out other Blog Banter articles at the bottom of this post!